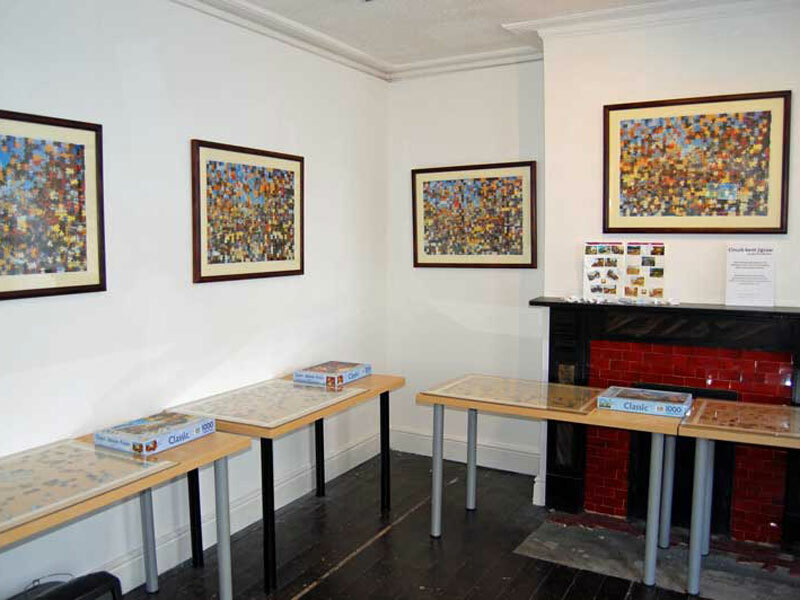 These are the jigsaw pieces, or pixels, which were rejected by conceptual glitches in the process, leaving dead pixels/empty spaces in the images. They are discrete pieces of information which never arrived at their intended destination. In a digital process, they would have disappeared off into the ether, but these physical pieces are trapped in purgatory (my wallet). I’m not sure what to do with them. Circuit-bent jigsaw #1: Generated on Friday 6th February 2015, between 11:01:06 and 15:59:10. Greatest number of possible permutations possible (see here for a very large number). Also, a number 2 was thrown 8 times in a row (O14-O21). The odds of this are 1,679,615 to 1. Circuit-bent jigsaw #2: Generated on Friday, 13th February 2015, between 11:00:52 and 16:44:08. First conceptual glitch observed at B36. See this post. Circuit-bent jigsaw #3: Generated on Friday, 20th February 2015, between 10:30:05 and 15:41:52. Two different types of conceptual glitch observed at B20 and X6. See this post. Circuit-bent jigsaw #4: Generated on Friday, 27th February 2015, between 10:31:55 and 15:33. Conceptual glitch observed at X5. Circuit-bent jigsaw #5: Generated on Friday, 6th March 2015, between 10.52:05 and 15.37:35. Conceptual glitch observed at B36. Room filmed for this performance. The most demanding of the six performances. 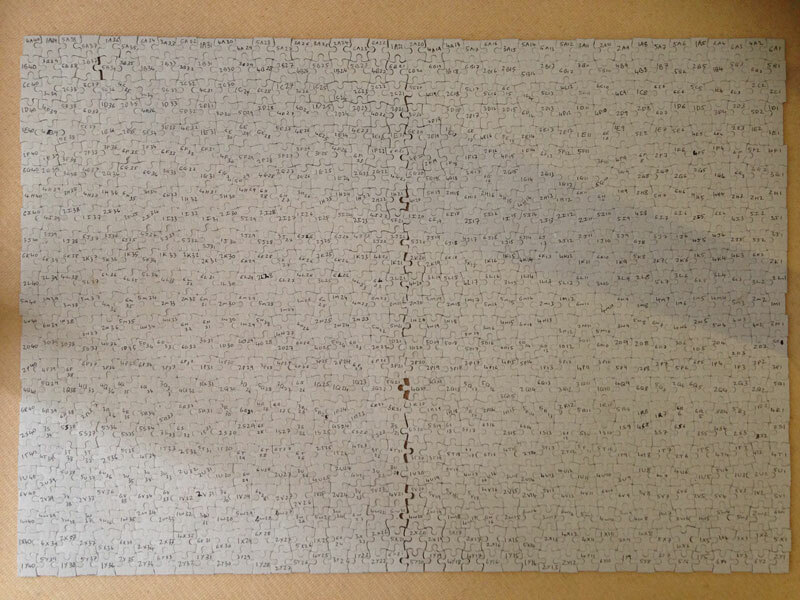 Circuit-bent jigsaw #6: Generated on Friday, 13th March 2015 between 10.31:10 and 15.45:57. The concluding piece and the subject of this blog post about whether to throw the dice or not. The most unusual to perform. Circuit-bent jigsaw #6 brought with it a quandry. The rest of the pieces having formed the 5 other jigsaws, there would be only one piece to fit into each grid position, or pixel. Practically speaking, there was no need to roll the dice, because only one piece was possible. I would be able to see where the next piece should come from much more easily than in previous weeks, so it should be much easier and faster to complete #6. So, no need for the dice. This, for some reason, did not initially feel particularly at odds with the process. This last generation would simply be a matter of “tidying up” the leftover pieces into the final finished image. 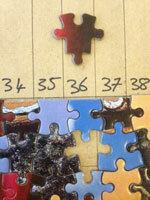 But by that rationale, it would be fine to take a clump of joined-up pieces and add them to the new image as a group. This most definitely did not feel right. I had somehow lost sight of the fact that that what the system would do is carry on precisely as it had been operating for the previous five generations, throwing the dice and beginning the search at the given starting point and searching in a clockwise manner. 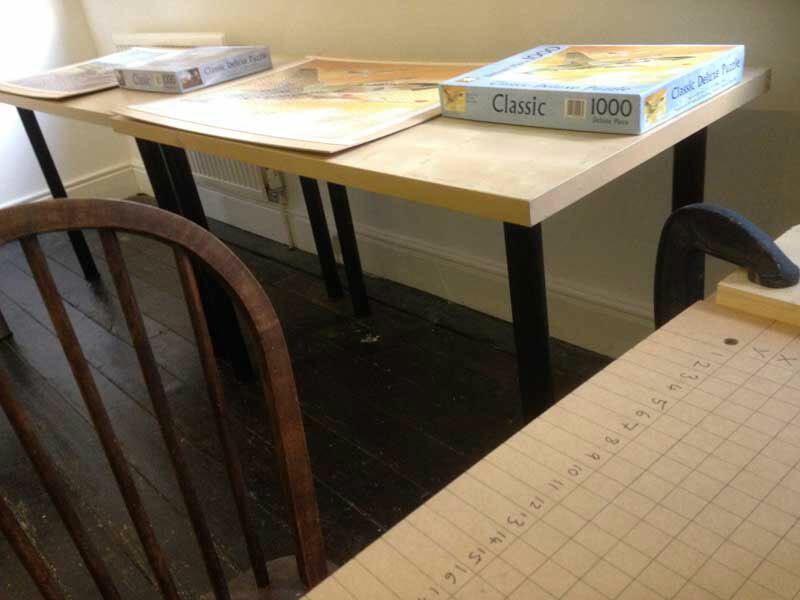 It became clear that I must continue to follow the whim of the dice, ignoring my own observations as to where in the room the relevant piece was located (thankfully my memory is so poor, this was not as frustrating as it might have been). Though this process would have no effect on the image, it is the only constructive process that had been put into place, and therefore must be followed, ignoring the human urge to speed up the process by increasing efficiency and inventing shortcuts. The system is indifferent and immune to these gestures towards innovation. 2) to put into place the conditions under which true conceptual glitch, i.e. unplanned accidents, could occur and possibly be recorded in the images. At times, I have felt like a physicist deep underground, waiting to observe and document an elusive particle that exists up to now only in theory. Firstly, the glitches as a result of a manufacturing anomaly seen at B36 (#2 & #5) and X5 (#4) and X6 (#3), as described in the post mentioned above. Secondly, in #3, the glitch at B20. This occurred only once across the 6 performances. In short, because of the irregularities around the centre line (again, explanation in this post) there are possible “big versions” and “small versions” of all of those pieces bordering the 20/21 columns (just as is seen on the jagged edges of each jigsaw). On this occasion, a perfect storm occurred in which all of the surrounding large versions were chosen, encircling the B20 grid position, making it too small to enter the piece. Information rejected. Dead pixel. 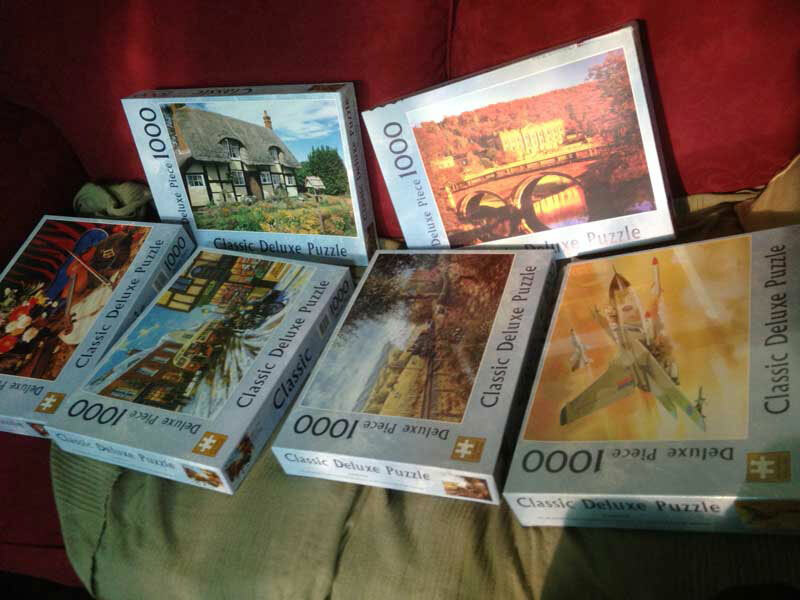 …were made by JHG Jigsaws, who were the only company that I could find who could cut all jigsaws along the same pattern. I was given a list of those images that were possible, and I drew lots to choose the six final images. It was important that no aesthetic judgement was allowed into the process. Part of the reasoning for this piece is not only to replicate processes which generate glitch-alike or aesthetic-glitch images, but to put into place the conditions which could enable genuinely conceptual glitches to happen. As mentioned, a deliberate attempt to cause a glitch cannot be seen as a true conceptual glitch, so all possible attempts have been made to avoid any foreseeable problems or errors. 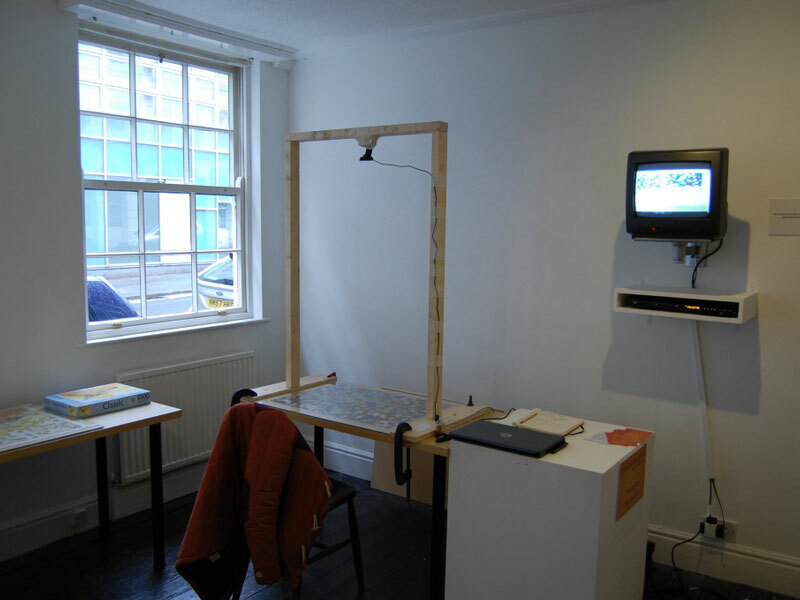 I have considered the possibility of being hit by a bus, thus causing the piece to permanently glitch, though of course as it is a simple system, it could be carried out by any person or machine (as long as they have the capacities to perform the task). In the event of my death, it will have to be decided whether the process can be run by a different piece of hardware who could continue the jigsaw generations, or whether the process has permanently glitched, leaving the remaining frames empty. Our first glitch is not quite as dramatic, but does have a visible effect on the generated image. 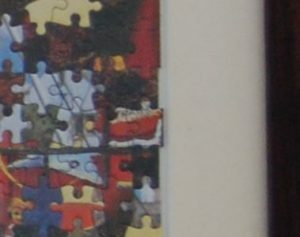 I have had these jigsaws specially cut to the same pattern by an obliging company called JHG Jigsaws (and a very patient lady called Julie), so that a piece can be taken from a particular grid position on one jigsaw and placed in the same position on another. 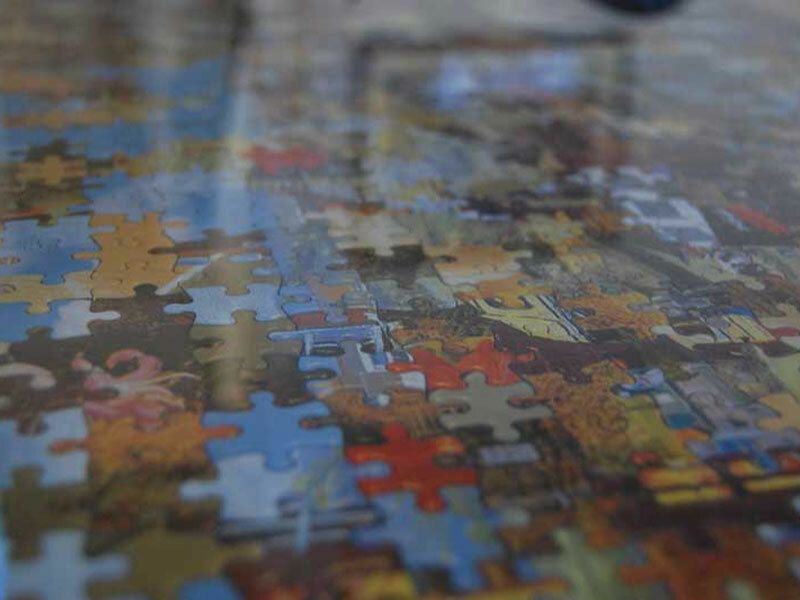 In addition, virtually all jigsaws are made in two halves which are then attached down the middle (if you pull apart any standard jigsaw, you will notice a gap down the middle where the two halves connect). One side is the rotated copy of the other, so that the bottom left and the top right pieces are the same but 180 degrees rotated. As the middle is also two edges, they also obey the jagged edges rule, and as a result, do not fit together neatly as they would normally. 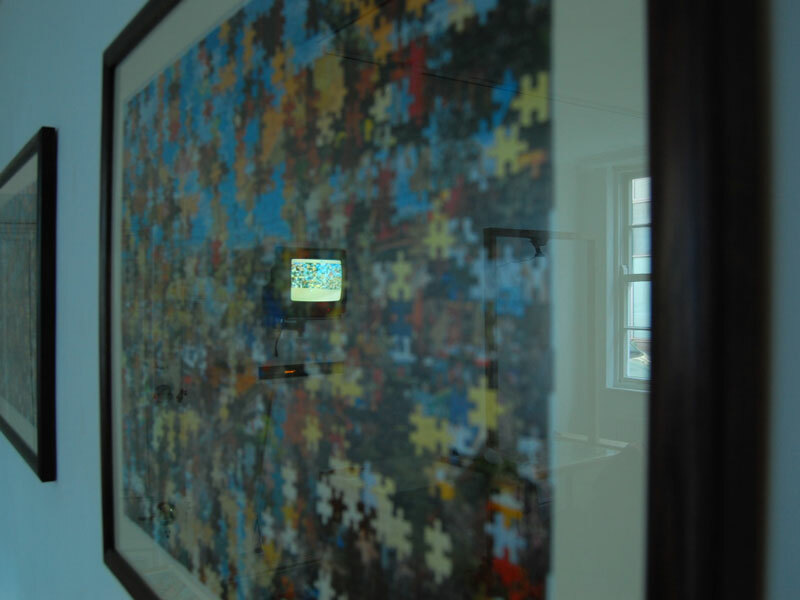 I do not consider this a conceptual glitch, as I had predicted it, and the pieces can still be placed together without much interference, though not as tidily. 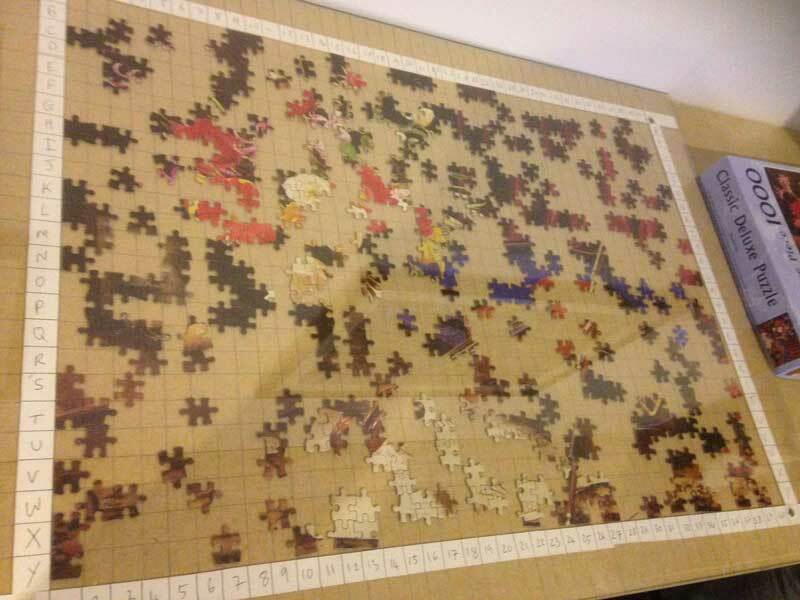 However, in the creation of Circuit-bent jigsaw #2, it became apparent that there was an anomaly, namely B36 and the pieces either side of it. In short, it was too large to fit the space. 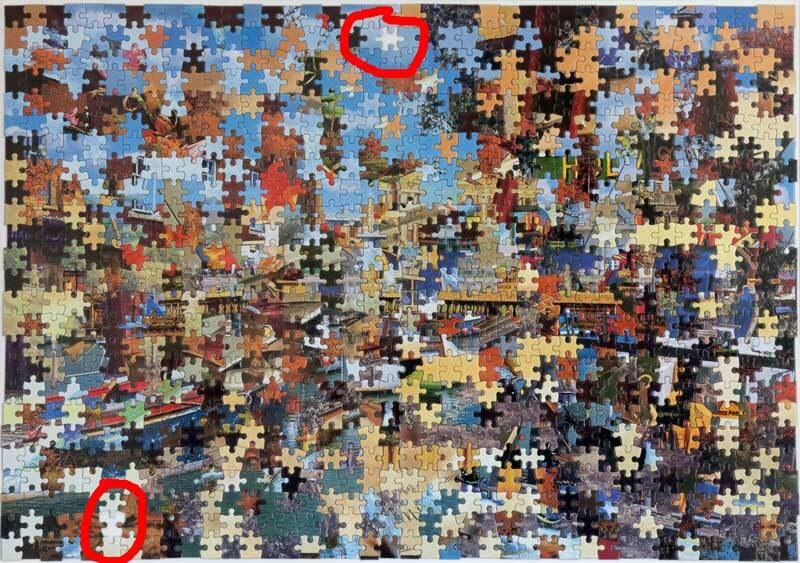 On investigation, I found that Jigsaws 2 and 6 share this anomaly, which is of course mirrored in the bottom left corner at X5 (where the piece was smaller, so could fit, though with some empty space). 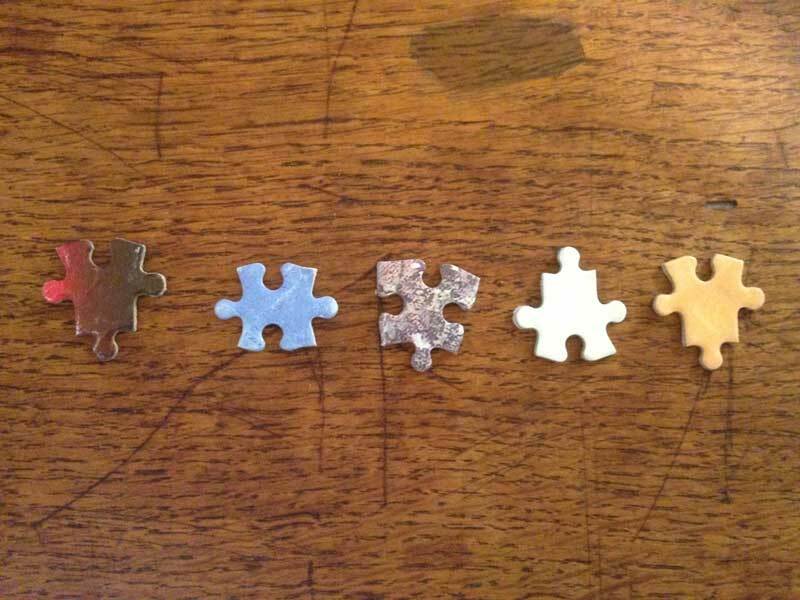 3) Replace the piece with a smaller piece from that position from the next jigsaw along. Option 2) seems like a very human solution to apply to an automated, pre-determined process so can be rejected. Option 3) suggests an alteration in the programme to accommodate new information, i.e. the system is learning. There is no reason to think that the system has any such capability. Therefore, Option 1) is the most realistic reaction. The unit contains no information and as such will be left blank, an absence, a dead pixel. 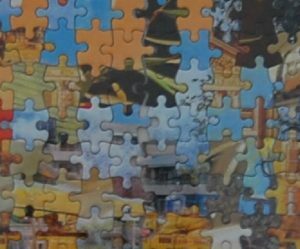 “By rearranging the jigsaws, you destroy the meaningful interpretation of the scene, but continue sampling from the same underlying distribution (which is, as a consequence, highlighted, since the coherent interpretation of a scene is no longer there to distract)”. Images from Torralba, A., & Oliva, A. (2003). Statistics of natural image categories. Network: Computations in Neural Systems, 14, 391–412-391–412. The above images were generated by compiling hundreds of images which conformed to each of the broad subject categories. Though there are variations between natural and man-made environments, scenes are generally lighter at the top, conveying the light source of most environments whether natural or otherwise. They are also constrained by human perspective and as a result are usually viewed from a human standing height. Scenes which involve greater distances tend to be anchored on the horizon and feature smoother textures as visual “clutter” decreases. 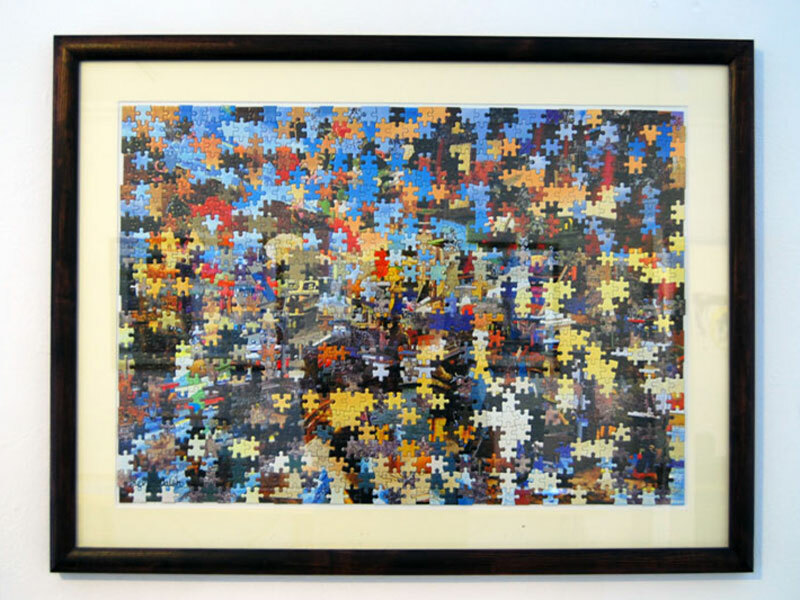 These principles can be seen in the Circuit-bent jigsaws, with lighter shades appearing at the top of the images, and the viewer’s eye drawn in to the central, distant point. 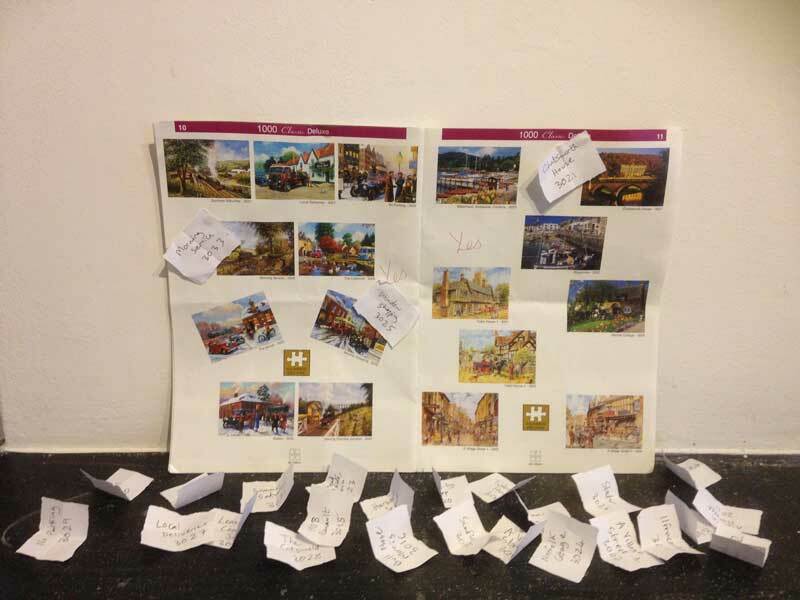 Though the individual units of the scene have been stripped of their semantic or contextual attributes, they still adhere to a set of predetermined rules, which are retained in the randomised images. 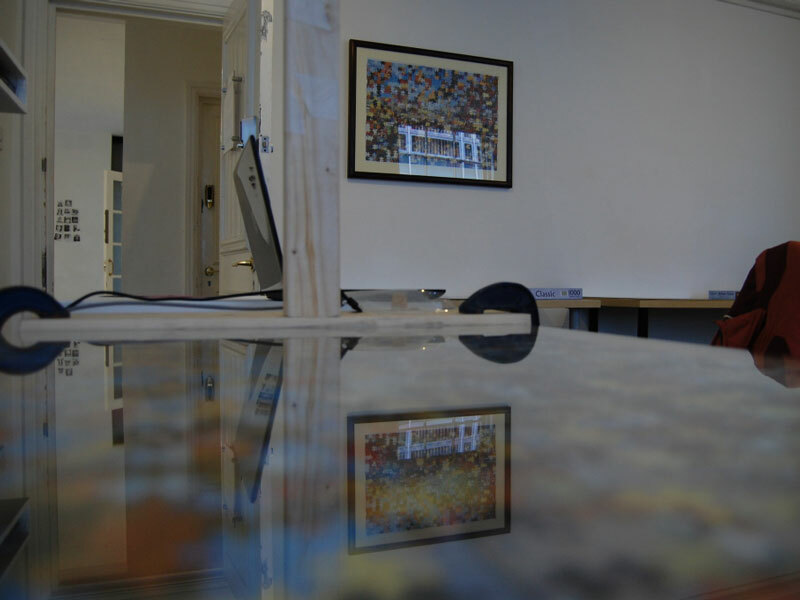 If you’ve been wondering how many different possible combinations of images there are, there are…….